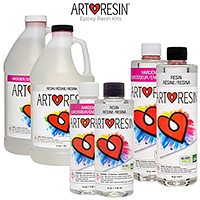 Non-toxic ICE Resin® two-part formula dries and stays crystal clear, never yellowing or breaking down. The versatile and easy-to-use jeweler's grade formula can be used with bezels, creating a clear dome as it covers and magnifies the image inside it. Mix the resin with sand, grass, sticks, paper and metal objects. Create freestanding projects or use a mold to make dimensional pieces. The package includes Part A Resin (4oz), Part B Hardener (4oz), stir sticks, measuring cups and instructions. Dries in approximately 6-12 hours in 72-degree temperatures. Neat and easy clean-up.